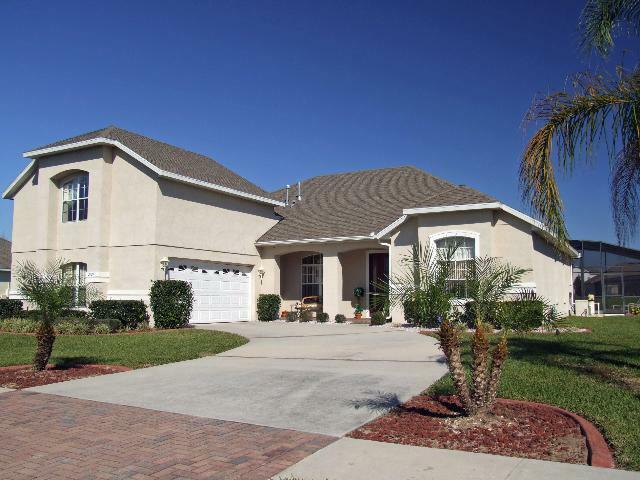 Lake Star Villa is located on Star Lake in Formosa Gardens Estates, one of the most spacious and prestigious development in Central Florida and is only two miles from the Disney parks and a mile from Highway 192 with its many restaurants and shops. Access to all the Orlando attractions is easy with Universal only a 15 minute drive. This home has the added benefit of FREE UNLIMITED calling anywhere in the world! FOG5404 vacatrion villa boasts over 3,100 square feet of luxurious living space, sleeping comfortably 12 including two master suites (one with office with computer and high speed internet, one with lounge),and the master upstairs sitting area has a queen and single sofa bed, one queen with its own bathroom and two beautiful twins sharing the fourth bathroom. All bedrooms have flat screen TV's. The huge family living area leads from the open plan kitchen with breakfast bar, table and seating area. The entrance vestibule leads to a more formal sitting room and a large formal dining room. Everything is brand new and both decor and furniture are from professional interior designers, not the typical vacation home rental furniture! This kind of attention to detail is designed to allow you to enjoy both the elegance and practicality of FOG5405. The screened Pool and Jacuzzi looks out to the lawn which runs to the banks of this amazing vacation home. house is fully air conditioned with multichannel television in all bedrooms with a huge 60” LED TV in the family lounge. There is a game room with pool table and many toys. Bicycles are supplied for your use. There is also a PlayStation 2.This is a beautiful home with every feature you could imagine, and pure luxury too. Reserve your dates before someone else does.